Kwadrofonik was established in 2005 as a result of the merger of two duos: percussion and piano, Magdalena Kordylasińska and Miłosz Pękala (Hob-Beats Duo), and Emilia Sitarz and Bartłomiej Wąsik (Lutosławski Piano Duo). These have formed the only such quartet in Poland and one of few in the world. In 2006 the group won the Grand Prix, the Audience Award and the Award of the Mayor of Warsaw at the 9th Polish Radio Folk Festival called “New Tradition”. Music critics have praised the ensemble as the most innovative of its kind, setting new directions in folk music. Shirley Brill is one of the world’s most outstanding clarinetists and a professor at the Hanns Eisler Academy of Music in Berlin. She has won two important music competitions in Markneukirchen (Germany) and in Geneva (Switzerland) and has also won the Special Prize at the ARD International Competition in Munich (Germany). She has played with artists such as Daniel Barenboim, Sabine Meyer, Emmanuel Pahud, and the Jerusalem Quartet. She has performed at many prestigious venues such as Carnegie Hall in New York, Salle Pleyel in Paris, the Musikverein in Vienna, La Scala in Milan, and the KKL in Lucerne (Switzerland). Sinfonietta Cracovia developed from the “Young Cracovian Chamber Musicians”[Młodzi Kameraliści Krakowscy] ensemble which was founded in 1990. The talent, professional skills and commitment of the musicians and the freshness of their interpretation won them recognition but it was clear that the further development of this ensemble was only possible with stable financial assistance. 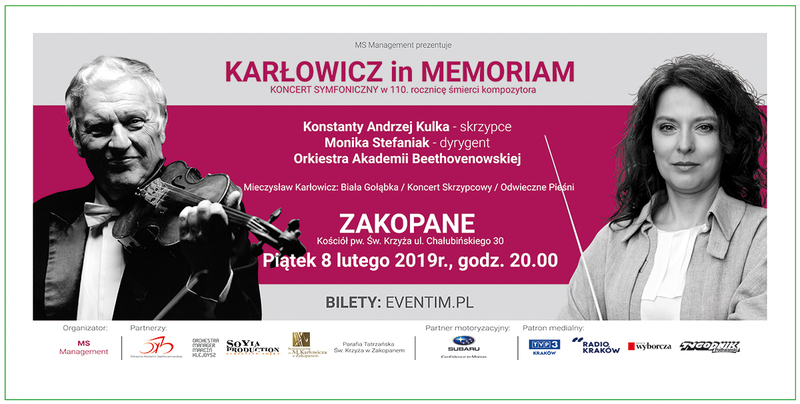 Thanks to the support of Mr Krzysztof Penderecki and his wife Elżbieta the ensemble became a municipal orchestra in 1994 and was renamed the Orchestra of the Royal Capital City of Krakow Sinfonietta Cracovia [Orkiestra Stołecznego Królewskiego Miasta Krakowa Sinfonietta Cracovia]. Łukasz Długosz is recognized by critics as a leading flutist in our time. He is a graduate of the Hochschule für Musik und Theater in Munich, the Conservatoire National Supérieur de Musique et de Danse in Paris and Yale University (USA). He has won several prestigious international competitions in Paris, Munich, Odense (Denmark), and Viggiano (Italy). He has performed as a soloist and chamber musician in Europe, Asia and the USA, and with many renowned European orchestras at venues such as Carnegie Hall (New York), the Musikverein and Konzerthaus (Vienna), the Konzerthaus in Berlin, Munich Philharmonic and the Gewandhaus in Leipzig (Germany).